April 19, 2018 – In the wild forests on the Fiji Islands, there lives a special species of frogs, the Yellow Tree Frog. On an all-new Yellow Titanium coin, the British Pobjoy Mint celebrates this tree dwelling creature in 2018. The same image will also be shown on a second coin struck from Proof Sterling Silver. Fiji / One Dollar / Yellow Titanium / 10g / 36,10mm / Mintage: 7,500. It has proved difficult to decide on which animal to showcase on 2018’s Titanium coin for Fiji, as the Islands have such a beautiful and diverse selection of flora and fauna. The Mint came to the conclusion that the Yellow Tree frog captures the essence of the rainforest with its vivid colours and unusual appearance. 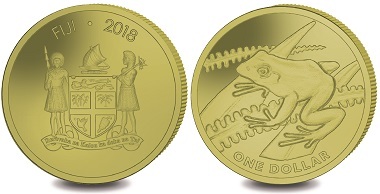 The design on the reverse features a Yellow Tree Frog resting on some leaves. As Titanium reacts differently with every strike, each Yellow Tree Frog coin is technically different and varies slightly in colour. There is also a lined effect that is present on the coins which is unique to this metal. The obverse features the Fijian Coat of Arms a heraldic design consisting of a shield with the Cross of St. George, Fijian Warriors, a canoe and a Lion on a stunning proof background. The denomination of both the Titanium is One Dollar and the Proof Sterling Silver coin is Two Dollars. The Fiji Tree Frog or Platymantis vitiensis is a tree dwelling frog that is endemic to Fiji. This little frog reaches a maximum size of 60mm and can be found in an array of different colours, from a creamy grey to a vivid yellow. In the wild, these frogs live close to rivers and streams and prefer living amongst secluded foliage. They are good swimmers, climbers and can jump quite a distance to evade predators! This link takes you to the Mint’s website. More information on the Tree Frog can be found here. Fiji’s coins and paper money often showcase the country’s nature, as this article shows.